Contact Mike at info@smashacademy.com.au or 0414 888 563 for more information. SMASH runs both Speed & Agility programs and Strength & Conditioning programs for athletes during school terms & various clinics throughout the year. See below for clinics that we have run recently. 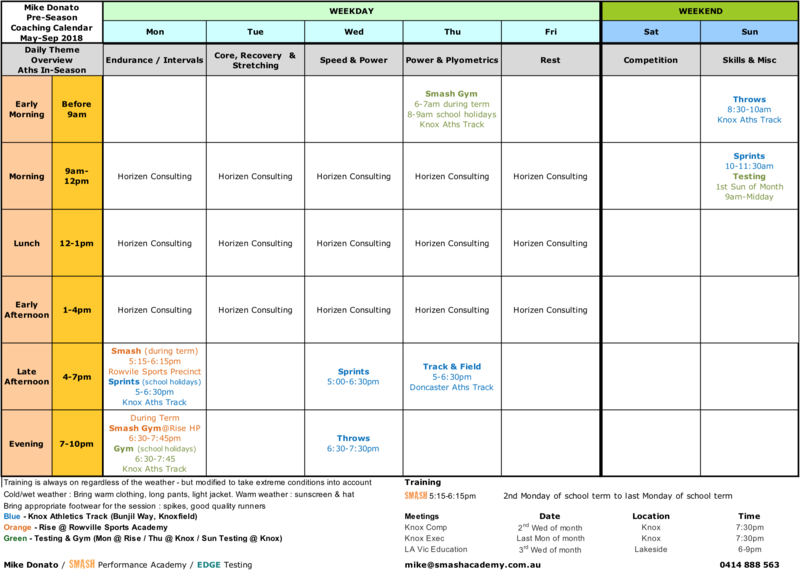 Download my detailed coaching calendar for 2018 (word docx). Programs run for 60 minutes once a week for 8+ weeks during school terms (Term 1 is a 9 week term). 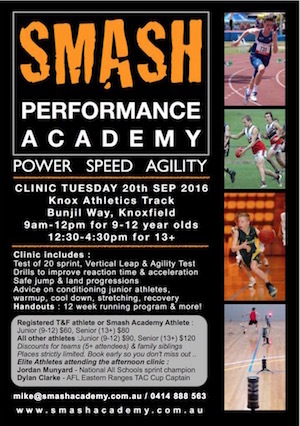 The Smash Monday night speed & agility sessions are suitable for all ages from 10-18 and are tailored for the athletes attending. Younger athletes learn basic skills while older athletes are stretched according to their skill level. But everyone has to get the basics right. $200 for 8+ sessions ($25 per class) for the one session a week during school term program. A proven, comprehensive, scientific and progressive training program that develops all aspects of athletic skill & performance for athletes aged 10 to adult. - advice on diet, recovery, stretching, shoes, foam rolling and more! $200 for the 8+ week program. - $25 per session or $30 per session if attending casually. Learn to get strong & fast the right way. Programs are suitable for both junior athletes & adults. 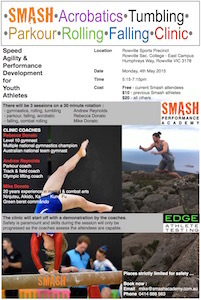 These sessions are run personally by head coach Mike with assistance from interns & other SMASH coaches. Sessions are held in the Rise High Performance Gym at Rowville Secondary College, Sports Precinct, adjacent to Show Court 1. After we finish up with the speed & agility athletic development session we move into the gym. Gym sessions run on Mondays from 6:30 to 7:45pm. kettlebells, barbells, dumbbells, bodyweight, core, olympic lifting, all the fundamental lifts & much more. We follow the ASCA guidelines for working with junior athletes. Weights lifted are age, development & technique appropriate. It's an urban myth that children shoudn't do strength & conditioning. We start with body weight athletes & slowly work them up over a number of months & years to free weights. We are particularly careful with spinal loads - athletes learn the correct technique first using light weights. Heavier loading is only done well past 16 years of age & only after athletes can demonstrate proper technique & have 12 months of lifting experience under direct coach supervision. If athletes are doing SMASH, sessions are $10 each. If not enrolled in SMASH, sessions are $20 each. 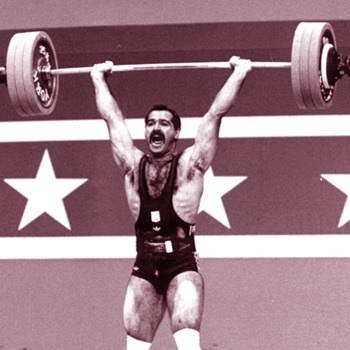 Rob Kabbas is the biggest name in Australian weightlifting. Rob has been training, competing, coaching & administering in the sport of Olympic Lifting in Australia for almost 50 years. Olympic silver medallist, 2 Commonwealth games gold medals, ex president of the Australian weightlifting federation, Olympic selector & much more. He has competed at 3 Olympic Games as an athlete & attended many more as official & coach. Rob regularly does lifting clinics for Smash. 6 hour clinic split into 2x 3 hour sessions on Thu 6th & 13th April from 9am til midday at Knox Athletics Track, Bunjil Way Knoxfield. * $20 off for session 1 with early bird registration if booked by Sun 30th April. Suitable for all ages from 10 & up, including adults. Older & more advanced athletes will be in separate groups depending on numbers & age breakdown. The second session will be more advanced & suited to older athletes from 14 and up. Places will be striclty limited to maintain high coach to athlete ratio. Includes handouts & presentations in each session. Along the way various topics like nutrition, footwear, recovery, injury prevention & stretching will be covered. - Holiday Clinic on Sprinting, Speed & Agility. Head coach Mike has been assisting the AIS & the AFL at the National AFL Draft Combine speed & agility days for the last 2 years and it's apparent that even the best junior AFL prospects in the country need a lot of work in their sprint and agility technique - enter SMASH as that's exactly what we do! Informally run in the past with elite players - improvements in times of 0.3-0.4s are typical for 20m sprint. 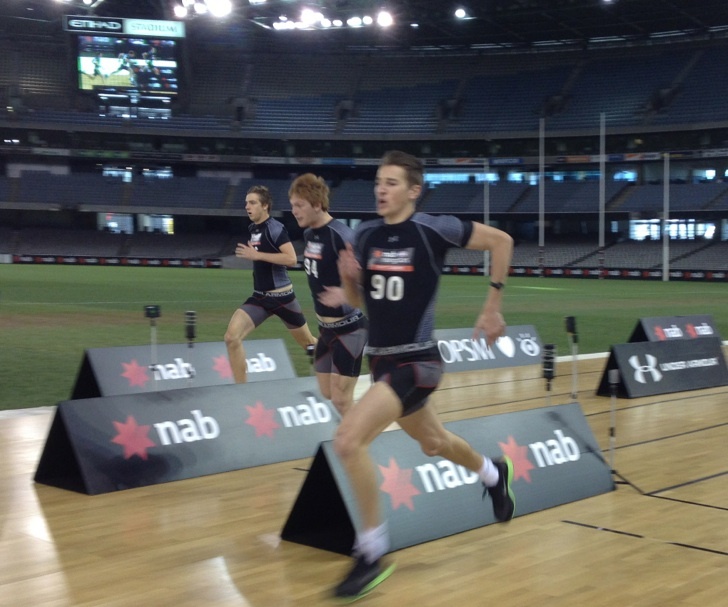 We use the same equipment as the AFL, NBA & NFL (Fusion Sport timing gates). We cover starting, agility & sprint techniques. This unique program gives specific tips for improving your vertical leap, 20/30/40m sprint in addition to national combine agility tests (AFL, Basketball, Soccer, etc). Wanting to make it overseas on a scholarship? If you do poorly at testing you typically wont make it to the next stage. We give you the best preparation possible with Pro tips and elite SMASH training. The last 2 years coach Mike has worked with Athletes Performance in their level 1 & 2 mentorship programs here in Melbourne - they are one of the best training organisations in the world. $120 for the 1 day combine preparation program. Contact Mike to apply for this elite & advanced program.